This time the hat I started out with came from Miuccia Klaar. The amazing “The Garden in my Head Hat” shows a watering can and some huge flowers in red and pink growing out some grass. So what to style around… I wanted to keep the hat center, but still have the colors repeated somewhere plus, I wanted to keep the art character of the hat for the whole look. I remembered black pants from [AD] Creations, wich had 2 huge pink buttons at the belly and a long waist decoration so I jumped into my [AD] folder and tried all pants till I found them. They are part of the “Haw outfit. With the buttons at the belly and the sheer parts on the right leg they were just perfect. To bring back the sheer part and to kinda make it pop out a bit more I decided to go with the shirt of the “Riga” outfit from SoliDea FoliEs. The amazing sleeves with the attached mesh hands are from [AD] Creations. For the boots I chose one of my long time favourites, the “Piccadilly Overknee” mesh boots from Leezu. For the actual Maniera Magazine December 2012 (http://manierasl.mymaniera.com/) I had the great honor to be featured in a wonderful fashion spread of Lovely Miwako. She made a special corset themed article about how different corsets can look. We all got sent different corsets from Etchaflesh and Voluptia and Lovely asked us to style them in a vintage non typical lingerie manner. As well she wanted us all to choose one tattoo that we wear through the whole spread. I love a lot the different vontage stylings from the 50’s to the 80’s ( it still scares me that 80’s are called vintage now too^^) and so I was going for my favourite urban look as well with the heavy boots and the tattoos and some fishnet stockings and torned stockings. The huge glasses and the pinup hair added the perfect finish for the look in my view. 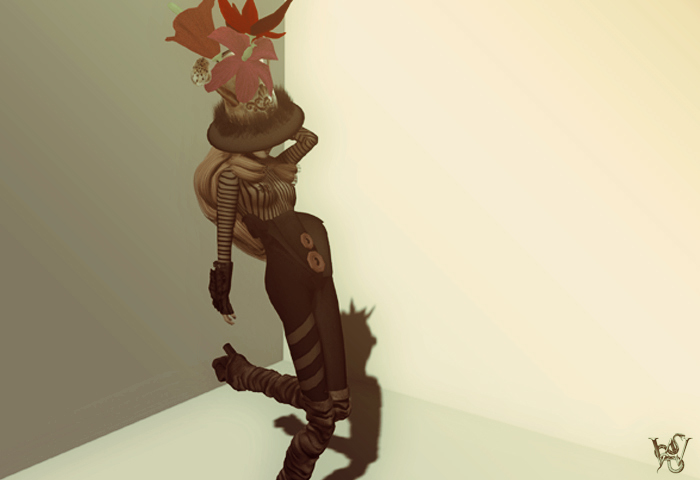 For the second look I was given the corset and the sneaker boots from Etchaflech. I added the neck corset as well from Etchaflesh, pantys and garterbelt from Maitreya.